A really nice day, digging the drain, shed and north east corner of the kitchen/scullery, on the east side of the north gable front of the house. Photo looking SE at NE corner of cottage, including gully drain and outlet drain-pipe. Looking S at gully trap and drain in front of NE corner of house and the ‘woodstore’. Our retired plumber/volunteer digger confirmed that the salt glazed stoneware gully drain had a trap to collect sediment at its base. 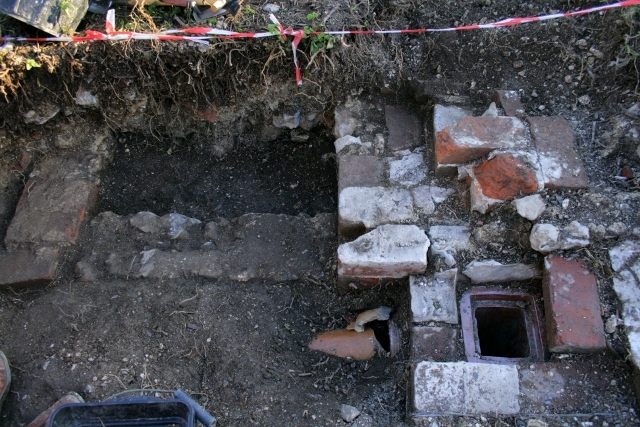 Further excavation to its east quickly revealed a buried drain pipe, which had apparently been very poorly connected to the gully trap’s outlet. He explained that the joint should have been sealed with tarred rope as well as mortar, but he had expected to have seen more mortar – which in his opinion indicated a shoddy job! The drain pipe was fairly near the surface and continued at a relatively shallow downwards angle in an eastwards direction. The only new find of interest from out of the gully trap was a minute blue bead. The ground surface on top of the drain – the path to the ‘wood-shed’ – was found to continue sloping downhill in an eastwards direction. 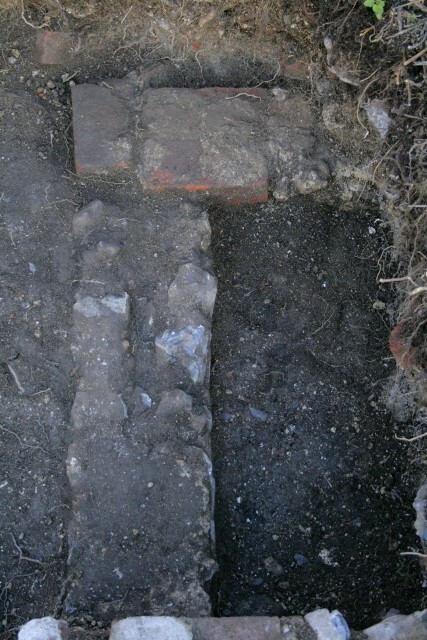 This supports the possibility that this drain was used to water the vegetable garden to the east of the house. The vegetable garden was at a lower level, but it is now completely buried by the bulldozed mound of demolition rubble. Looking E across entrance to shed. Immediately to the south-east of the drain, the front of the wood-shed was further excavated, and its east wall was uncovered. Luckily the shed was not as wide as was expected so its east wall was just clear of the base of the demolition rubble mound. The wall was just one brick wide, so this was definitely a ‘lean-to’ structure and not part of the main fabric of the building, which has been found to be half again as wide. Finds were not numerous, but we can’t be too greedy! A few of them were quite intriguing though. 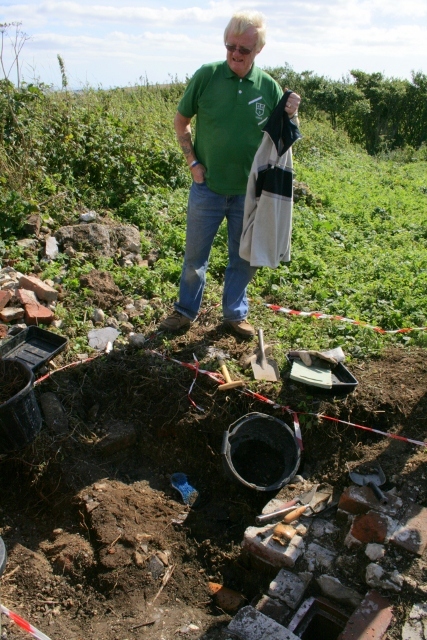 A large number of milk bottle shards, mostly from the Woodingdean’s Warren Farm Dairy, but one shard seemed to be from a dairy in Lewes – the first for the dig. A fairly large bead was also found, painted(?) in a mat green colour and possibly made of plaster. WW2 finds were just a single .303 cartridge and a short length of barbed wire. Only a few small ceramic shards were found, including the inevitable pieces of blue and white. 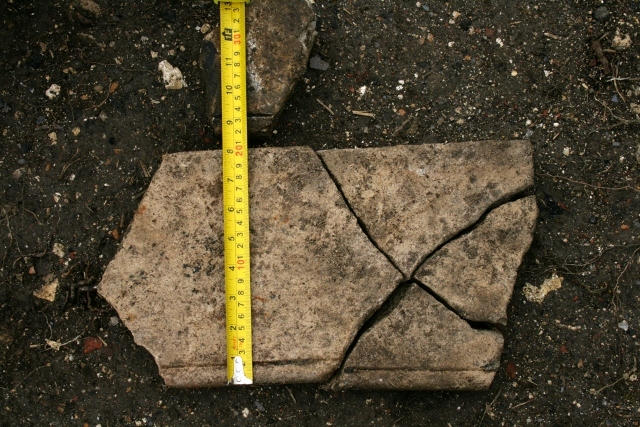 The first intriguing find was an ivory coloured rectangle, a little shorter than a domino piece. The other looked like a black plastic modern household electric lamp fitting, screw threaded inside and out, which is strange since there was no mains electricity, though the farm that the Phippses and Lathams worked for did have an electric generator installed, but it was a mile and a half away. There are also reports of WW2 camps elsewhere installing generators for electric lighting. Also found were two fragmented slabs of sandstone, one of which consisted of 4 joining pieces, 20cm wide, both of which had a narrow grove 2cm from a slightly radiused edge. Could they have been window sills? The next dig, Sunday, we continue exploring the garden shed, looking for any further secrets it may contain.